Head down the south row at the Olympia Farmers Market and Lynch Creek Farm's display of dahlia bouquets will catch your eye with brilliant color and texture. Dahlias have a cell structure more like spring flowers and lilies than most late-summer flowers. The high water content in the florets that make up dahlia blossoms catches and refracts light, and the intense color of many of the dahlia varieties is eye-popping. 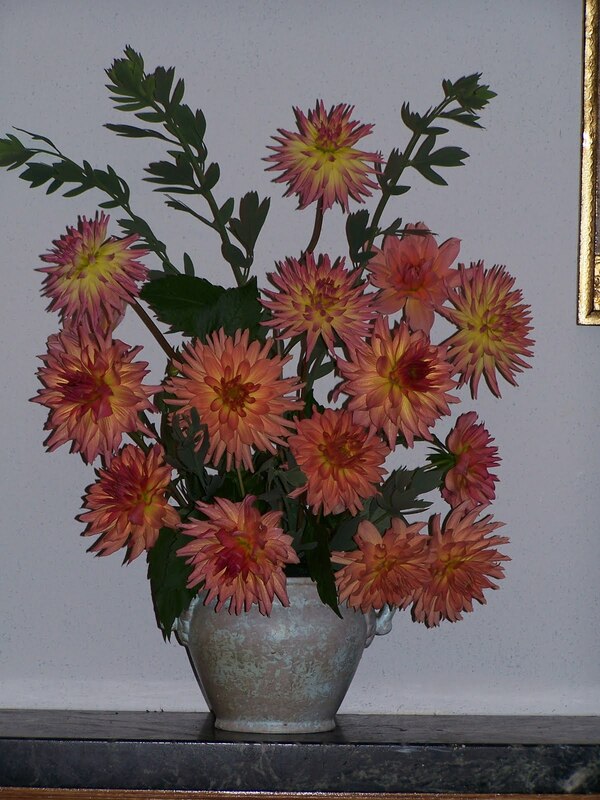 Look carefully at most dahlias and you'll see that some of this intensity comes from shading and sometimes streaking of analogous colors. 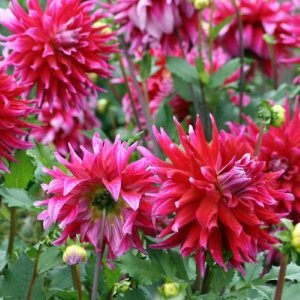 The Lynch Creek Farm crew picks and conditions dahlias at their best and brings them to market Thursday through Sunday each week from the beginning of August to first frost. In the fields at the Farm, the Lynch Creek gang also raises statice, zinnias and sunflowers, so the market bouquets may include these bright blooms as well. 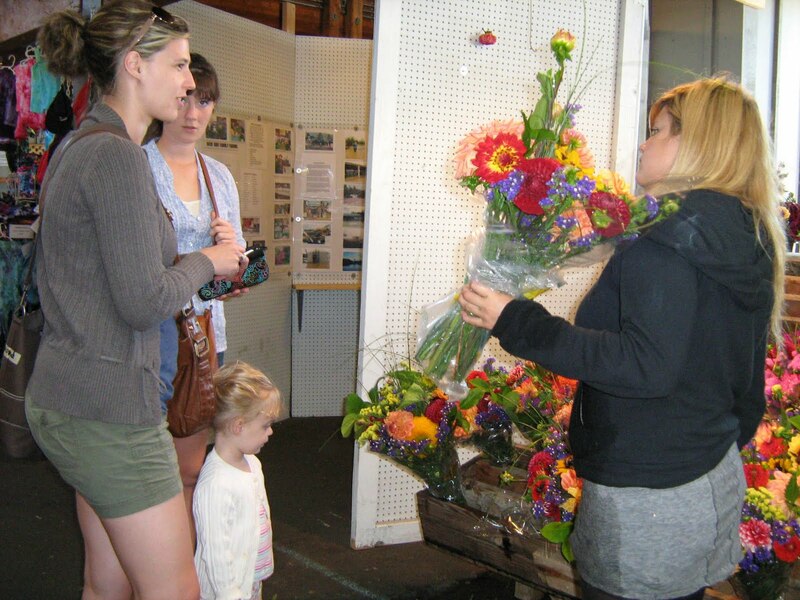 Customers can choose from among a rackful of pre-made bouquets or, on the other side of the booth, pick out stems of their favorite varieties and invent their own combinations. It's the kind of activity that draws onlookers into the action. 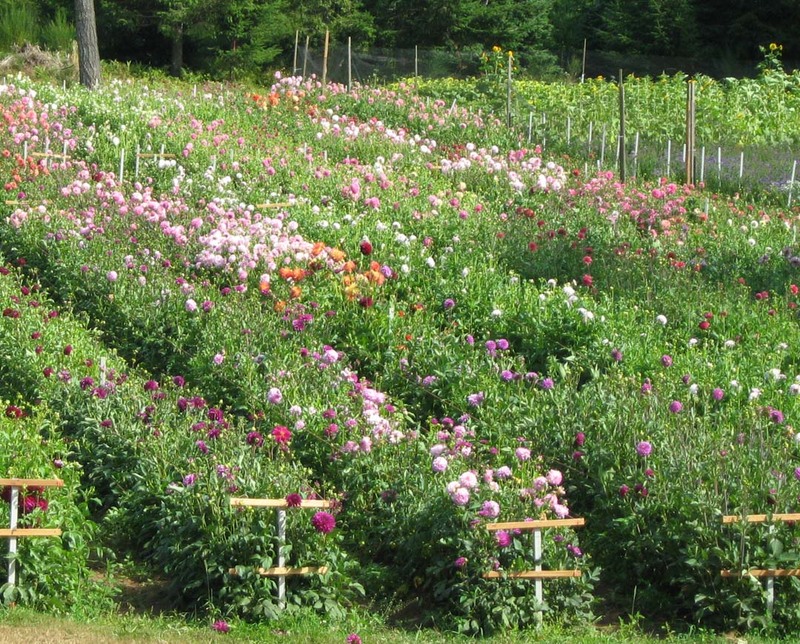 While the market is a major outlet for the dahlia flowers this time of year, weddings and other events claim their share of the blossoms from the Farm's fields. 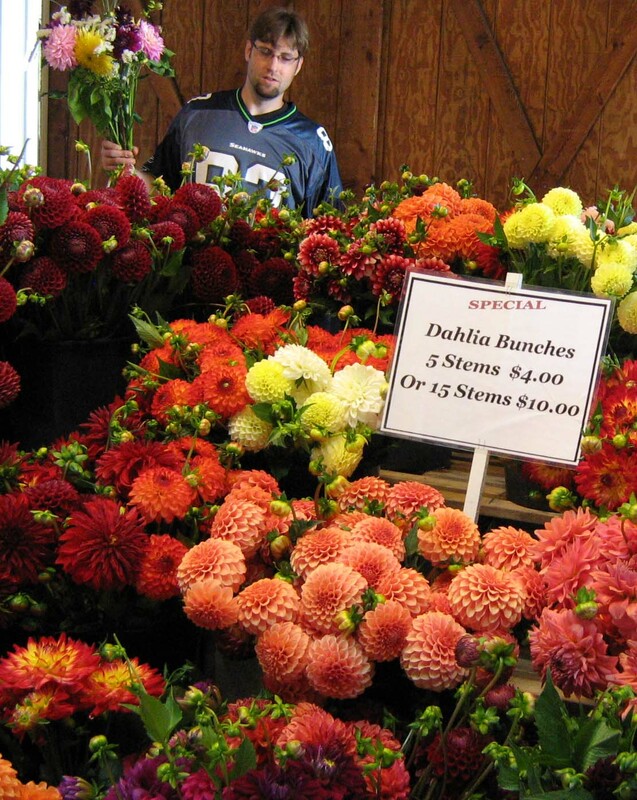 On a recent weekend, the coolers at Lynch Creek Floral, Andy Hunter's mother's business in downtown Shelton, were packed to the brim with centerpiece bouquets of dahlias for a major banquet at Saint Martin's University in Olympia, as well as dahlia bouquets for weddings and a funeral. Once regarded as only a garden flowers, dahlias are now a florist's standby. 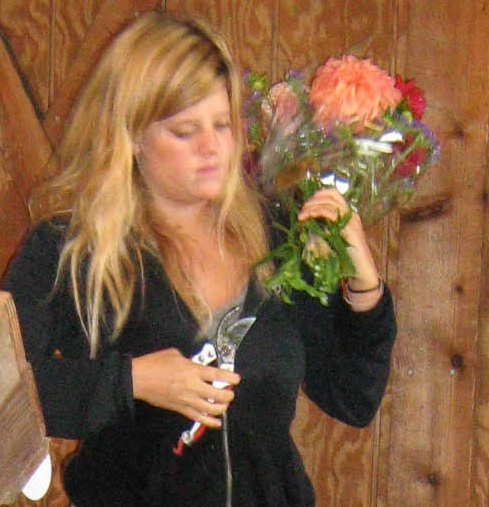 Meanwhile, at the market, it looked like every second shopper had corralled a bouquet of Lynch Creek dahlias. 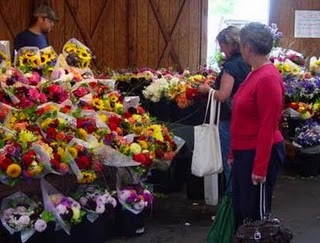 They were flying out of the market in a glorious profusion of color. And all the while, back in the fields, the leaves of the thriving dahlia plants were transforming sunlight and water and nutrients into fat dahlia tubers, ready for harvest this fall and planting in dahlia lovers' gardens next spring. 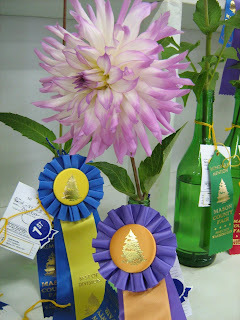 Over the years, dahlia shows have reflected popular taste. Early exhibitions featured new forms and colors as growers experimented with this horticultural discovery from Mexico. 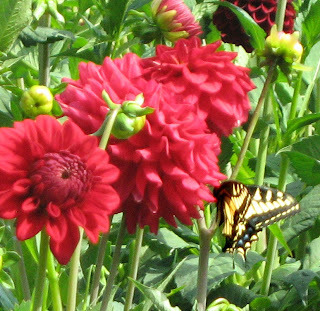 Through much of the 20th Century, size was the biggest factor as the so-called "dinner plate" dahlias grew ever larger and more dramatic. 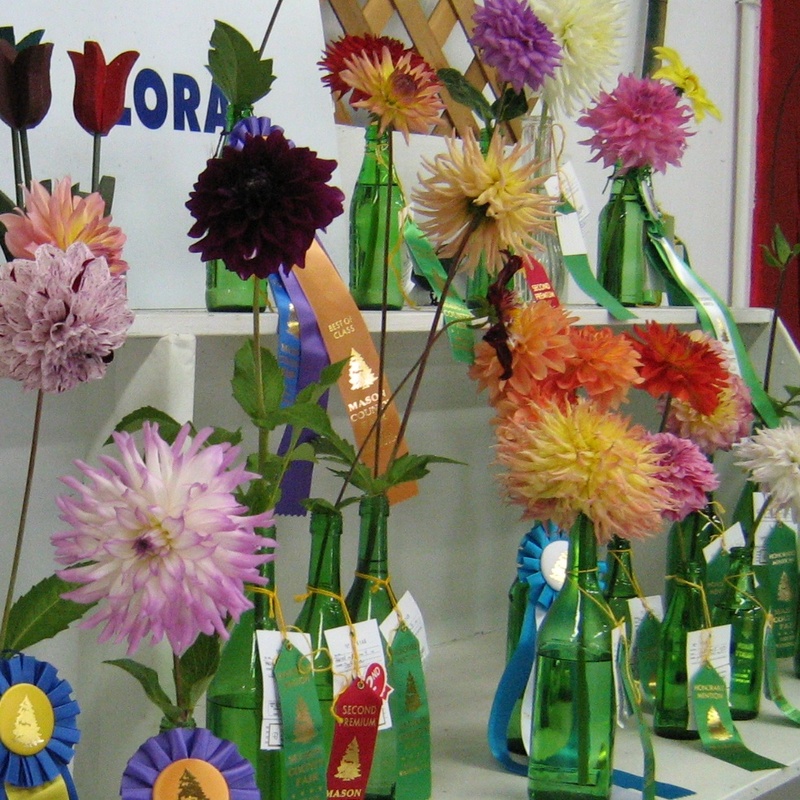 Today, form is generally the largest point category for judging dahlia blooms. it's followed (in descending order) by color, substance, stem, foliage, condition, and staging and bloom condition. In the display vase or bottle, single blooms should be of a height proportionate to the size of the bloom. Side buds should be removed well before the flower is cut (this is called disbudding) to display an adequate stem with leaves visible above the mouth of the container. It's important to read the show schedule or fair premium book to find out such things as whether you're expected to provide your own containers and, if so, what size they are to be. 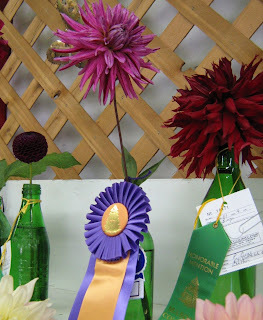 You should also be able to place them in the correct dahlia category (by size, or type, or color, as required). 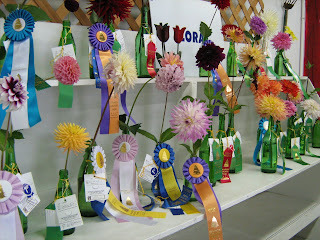 Flower arrangements at dahlia shows, as opposed to the categories in general flower shows and fairs, are often limited to bouquets, baskets, and large-scale standing arrangements. 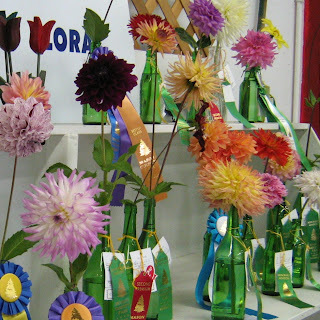 There may also be dried-dahlia and corsage categories. When showing dahlias, it's important to cut the blooms after they've opened fully -- but only just after opening, so that they retain their fine form through the duration of the exhibition. To help them last well, condition them by standing them in deep, slightly warm water that contains a supplement to extend blossom life. 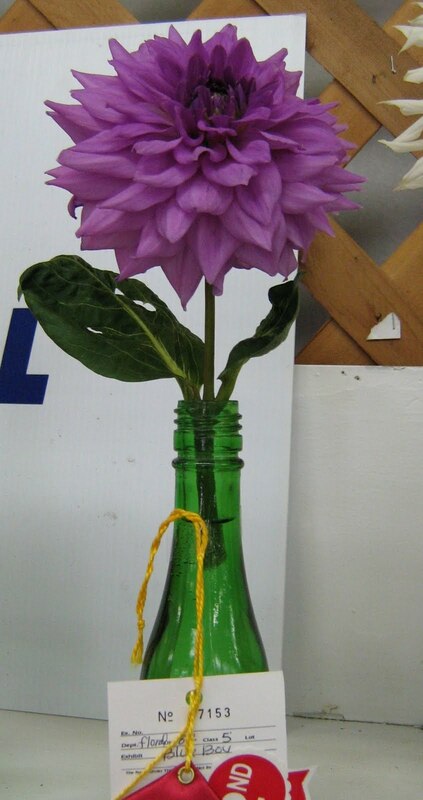 Showing your dahlias is fun. It also gives you a chance to compare your flowers with those of other growers. And of course, it introduces you to new varieties of dahlias you might want to add to your garden next year. A week ahead of schedule, too! Despite providing flowers for half a dozen weddings last weekend, the Lynch Creek Farm gang had hundreds of gorgeous fresh dahlia bouquets on sale (and sold 'em) at the Olympia Farmers' Market. The fields at the Farm are bursting with dahlias. Each day, another variety opens its first blooms. 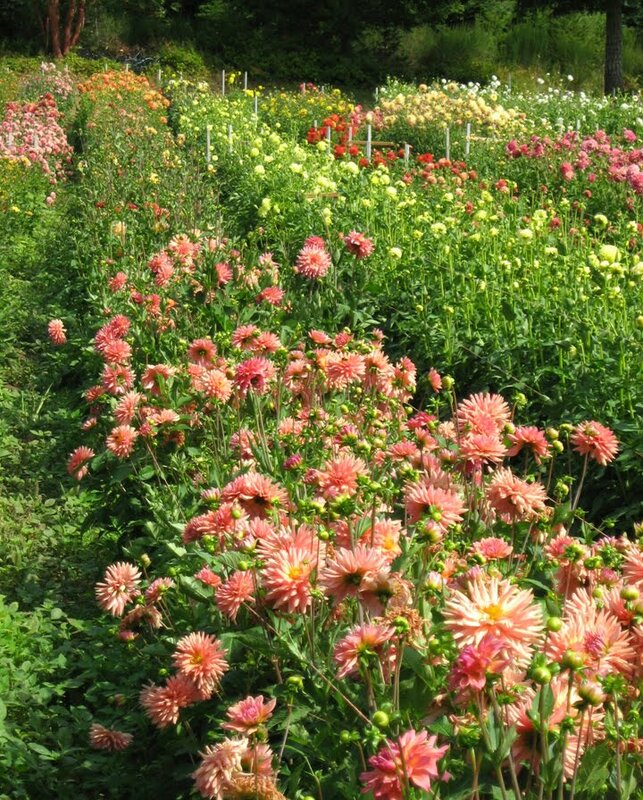 It's been a strange year, with a cool wet spring that delayed planting, but a spate of warm, sunny days alternating with warm, overcast days has apparently been just what the dahlia fields ordered. 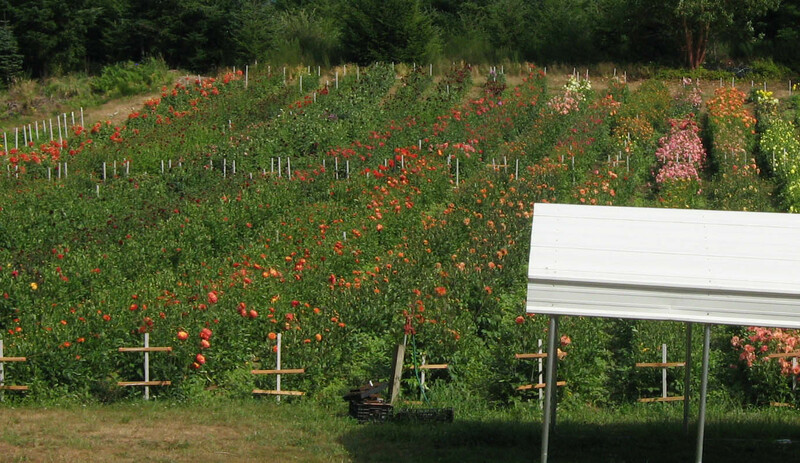 Growth has been tremendous, foliage is looking great, and the flowers are, well, magnificent. Not only does this profligate display of green and brilliant color mean an abundance of beautiful dahlia flowers for weddings and the market, but it means that all those leaves are feeding strength into the dahlia tubers that the Lynch Creek crew will dig at season's end and prepare for buyers to purchase and plant next spring in their own dahlia gardens. If you live in Western Washington, or plan to visit the area, don't miss the Olympia Farmers' Market at the north end of Capitol Way in downtown Olympia. 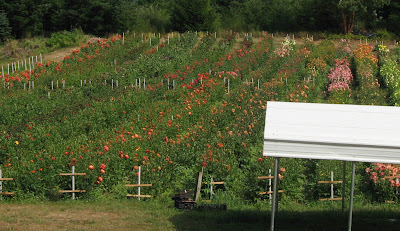 It's overflowing with cut and potted flowers, herbs, vegetables, fruits, fish, meats, cheese and other dairy products, bakery goods, live music, ethnic foods, crafts and of course, Lynch Creek Farm dahlias.